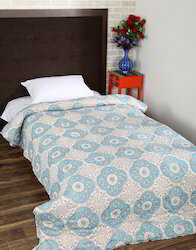 A really beautiful & attractive reversible bed Size Quilt with beautiful hand work made is from marvelous collection. Quilt is specially made for your decorated Home. An Attractive and Traditional Quilt is an ideal for different modern and traditional decor. We have used cotton fabric and quilt is filled with cotton batting. This quilt can effectively absorb the humidity in it and give off soon, just to keep a dry and comfortable condition & sleep better with this quilt. Description :This Beautiful whale baby quilt measures 38"x50". Super soft on your baby's skin. Ideal for cot, bed or snuggling under on the sofa. 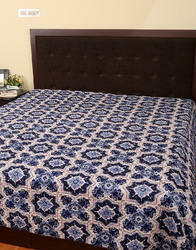 Bring home the exquisite blooming Indigo cotton quilt bedspread for your bedroom. Cotton made for the soft feel and the comfortable sleep. The free quilt block patterns all over that give it a rich appeal. Match your bedding sets with these traditional handmade quilts. Bring grandiosity at home with the hand block prints. The light weight cotton quilt with the soft cotton fill that keeps you warm.High-quality fabric for durability. Dry clean only for long life. Beautiful Quilt made of soft cotton cloth. Indian hand block print work. Grab a catnap under this Rajrang bed quilt. The imprints of Leisure Medallion patterns on the quilts give it a rich appeal. Match this quilt set with the other traditional home furnishing accessories. Both the face and the back material of this bedroom quilt is made up of cotton. The cotton fill makes the quilt light in weight and gives a comfortable sleep. The bedding quilt keeps you warm and snug in the bed. High-quality fabric for durability. Dry clean only for long life. Bring home a double bed size most luxurious bedding quilt for your bedroom. 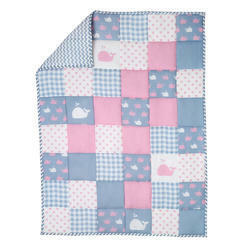 Made of high-quality cotton the quilts are suitable for daily use. Bring home this Rajrang signature collection for the grand appeal to the bedroom. Match other traditional bedroom accessories to this handmade quilt. 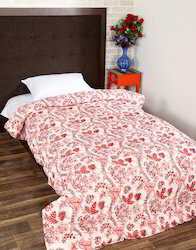 The indulging hand block prints in the Vivid Palampore design give the quilt a luxurious look. The cotton fill that makes it very lightweight. High-quality fabric for durability. Dry clean only for long life. 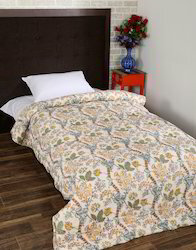 Get some undisturbed sleep with this floral handmade quilt from Rajrang. Tantalizing designs of Royal Grove are hand block printed on the single quilt. Match the quilt with the traditional home furnishing accessories. Both the face and the back material is made of cotton. The cotton fill for a light weight and comfortable sleep. The bedding quilt keeps you warm and snug in the bed. High-quality fabric for durability. Dry clean only for long life. • Beautiful Quilt made of soft cotton cloth. • Indian hand block print work. Use this hand block printed Rajrang bed quilts for your overnight sleep or even when you doze. 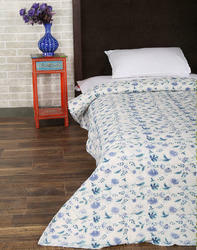 The floral quilt with the imprints of the Petiole Blossom pattern looks extremely soothing to your eyes. Try to match other furnishing accessories to create impressions. Made of high-quality cotton fabric the bedding quilt is good for daily use. The cotton fill makes it light weight and keeps you warm while you sleep. Dry clean only for long life. Get rid of your stress and sleep tight under this blue and white quilt.Bed quilt made of cotton from both the face and the back. Bring grandiosity with these traditional yet attractive prints. Match other furnishing accessories to this bedding quilt. The beautiful quilt collection has a cotton fill that keeps you warm in the cold winter nights. Light weight and highly durable fabric for daily use. The cotton material keeps you warm while you sleep. Dry clean only for long life. We are offering our customers an excellent quality range of printed cotton Quilt. Rajrang presents wide range of Indian designer Hand block print products. 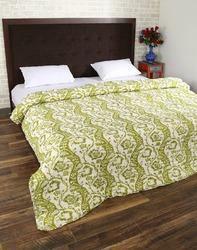 We Providing You a Best Range of block print bed quilts. This Beautiful Quilt Has Made From experienced Craftsmen and Given a Ethnic Rajasthani Look. Get yourself warm and snug with this double bed Rajrang jaipuri quilt. Traditional handmade quilts with the block printing. Cotton made a quilt for the soft feel and comfortable sleep. The cotton fill in between makes it light weight and convenient to use. Add grandeur to your bedroom with the tantalizing block prints. Match the bedding sets with the quilts to give your room an exquisite yet graceful look. Highly durable fabric that is skin friendly. Dry clean only for long life.